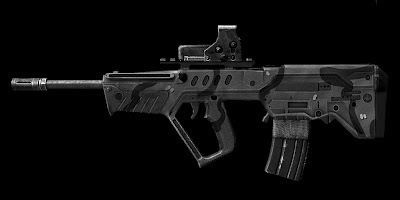 The TAR 21 is an Assault Rifle that was first introduced with the game. It has a high rate of fire for an assault rifle, good accuracy, low, and somewhat tolerable damage, and comes with a 30/60 magazine. The TAR has very high bloom in full auto, but very negligible bloom when bursted or tapped. It can have different mods, including the option to modify the stock, trigger mechanism, and aiming device (although many users prefer to use it in CQC due to its problematic crosshair "bloom" during prolonged fire). Being a jack-of-all-trades, it is fairly mod-dependent for good preformance. Overall, it suffers a considerable amount of bloom during prolonged fire, stemming from it's high ROF for an assault rifle, making it a low to medium-tier weapon for serious combat. It should be noted that this gun is unusually common given its usually lackluster reviews, which implies there is something about the TAR which makes it a worthwhile weapon for the standard player (or alternatively, this may be attributed to the fact it's the first unlockable weapon in the game). The Tar is also a great weapon to learn how to handle bloom, though a somewhat pricy lesson. Rapidly bursting, holding down the trigger for a moment, then quickly unclicking and reclicking will significantly help reducing any bloom. Firing 3-5 round bursts is most effective, and if done right, one can burst at nearly fully automatic firing speeds with only some loss in accuracy. As stated earlier, It is the first unlocked Rank weapon in ijji AvA.